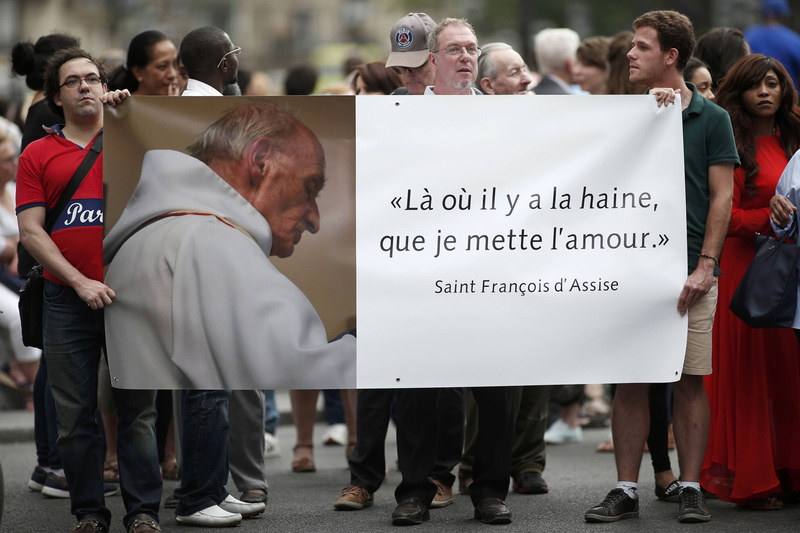 People hold a banner with a picture of French priest Father Jacques Hamel, which reads, "Where there is hatred, let me sow love," after a July 27 Mass at the Notre Dame Cathedral in Paris. The French priest, then 85 years old, was murdered while celebrating Mass in his parish church in Saint-Etienne-du-Rouvray, outside the city of Rouen in France on July 26by two extremists, who swore allegiance to the so-called Islamic State, which later claimed responsibility for this criminal act. They slit his throat, and police later killed the attacker. The killing shocked people of all faiths in France, and the following Sunday many Muslims across the country attended Mass in Catholic churches as a sign of solidarity with Catholics and of their total rejection of this vile crime. The slain priest’s sister, Rosine, represented the family at the Mass. She traveled from France to be present today, as did the archbishop of Rouen, Dominique Lebrun, and 80 pilgrims from the diocese including many from Father Hamel’s parish. Francis met them individually afterwards. The nine cardinal advisors of the pope, including Sean O’Malley, O.F.M.Cap., were also present. In his deeply moving homily, Francis recalled how the first Christians “paid with their lives” for their confession of Jesus Christ. They refused apostasy—to sacrifice to the gods of their time—and they were killed. That he was a Martyr was undoubted, but to be a canonized Martyr! Deo Gratias! Posting on Gerard O"Connell, 6/26/16 article on Fr. Jacques Hamel, I suggested the following offered here in brief excerpt, "Fr. Jacques Hamel was martyred because of his Faith in Christ ... he should be declared a martyr and a Saint." Very pleased Holy Father Francis agrees, naming him a Martyr and Blessed. Blessed Jacques Hamel pray for us! I hope as well that, the Holy Father will in time declare all who have died for the faith through terrorists killings present and future, Martyrs and Blesseds, including non-Catholics since all blood shed for Christ is sacred.